For most of us, an angel is either a winged fat-faced neutered child, invisible guardian preventing disaster, or a tall, majestic being delivering messages from the Divine. For Meredith Young-Sowers, however, flowers are the angelic messengers of wisdom and guidance from the divine. As odd as that may feel, in practice flowers are distinct and powerful symbols that convey a great deal of meaning. Constructed of 48 cards depicting lovely floral photographs by Judi Winall, the author's model of spiritual energy forms the core system for using, and understanding, this deck. In her model, the six aspects of spiritual energy are delineated by seven cards relating each of these areas: Reflection (becoming aware of your divine self); Partnership (gaining spiritual growth in relationships); Integration (creating inner harmony between the body, mind, and spirit); Alignment (doing meaning work that is aligned with your life purpose); Rejuvenation (following nature’s cycles to gain personal renewal); and Nourishment (thinking, eating, and feeling I ways that create spiritual fulfillment). Rounding out the deck are four ‘wild cards’ of Divine Guidance and two of Abundance. The companion book gives a thorough explanation of the spiritual model alongside instruction for how to using this deck. Interestingly (and a tad frustrating for a non horticulturist) the names of the flowers used on the cards are not given, even in the book. The author indicates that the learned associations are not important (like, roses signify love) and that each bud and bloom inherently offers a wealth of insight based on only its color and formation. Essentially, the reader is to use observation and openness to receive the messengers. On the one hand, I admire this desire to get away from pre-planned responses. On the other, I’m not sure that completely ignoring attached (cultural or sociological) symbolism was successful Card number 8, for example, is a star gazer lily. One of my absolute favorite flowers and I couldn’t help but add my associations into the cards message. While I am offering gentle criticism, the cards seem a bit awkward to handle. They are narrow (which is good for smaller hands) but seem very long which makes it hard to handle the cards. When I first saw these cards I was a bit ‘turned off’ by the more than slight ‘new age’ look and feel. And when I discovered the deck wasn’t using something like typical angels for artwork but flowers my reservations deepened. But the several draws I did were useful and accurate – which is, after all, what we want from our oracles. 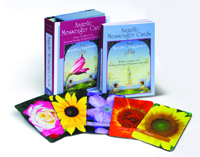 Both long-time divination enthusiasts and newcomers will enjoy the Angelic Messenger Cards’ ability to provide subtle, yet specific, messages from the unlikely envoy of flowers.